International Open Access Week is October 19-25. Portland State University Library joins this global event to celebrate, promote, and discuss open access, the movement to make scholarly content readily and freely available to the public. During the week, we’re taking the opportunity to highlight library services, resources, and promote webcasts and events on open access issues. You’re applying for a grant and your funding agency requires you to have a data management plan. You collected data and don’t know how to manage it. The journal to which you’ve submitted an article requires you to make the data supporting your conclusions available online. Or maybe you just want to share your archive of data, since others may be able to use it for other research. Check out our new Manage Your Research Data guide that walks you through the creation of a data management plan and supports you in managing and sharing your data. 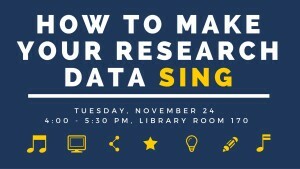 You can also attend Michael’s upcoming workshop, How To Make Your Research Data Sing, on Tuesday, November 24 at 4:00 p.m. in Library Room 170. For more information about data management, contact Michael Bowman, Data Management Coordinator.